On November 11, we remembered the Veterans who put their lives on the line serving our country and protecting the borders of our political interactions. Some carve the day out to barbecue and shake hands to say “thank you” to the men and women who served the country. But, beyond the handshakes and the one-day of recognition, what happens to the every day lives of these veterans? “It’s just one day that people get excited and then the rest of the year they forget about us. It doesn’t really mean anything for me and isn’t anything special,” said Ronald Jackson, 66, a Vietnam Marine Corp veteran. Jackson, who received a purple heart during his service, isn’t the only veteran who feels the same way. LAWT/ Sentinel staff recently had the opportunity to sit down and speak with seven veterans from the Los Angeles Veteran Center in Gardena about what it means to be a veteran—a Black veteran in America. The six veterans are Garnett Overby, 68, who served in the U.S. Marine Corps for four years and served two tours in the Vietnam War. Arthur Jarrett, 68, served in the Marine Corps for 3 years and did one tour in the Vietnam War. Ramon Roberts, 68, who was apart of the eleven Armor Calvary in Vietnam and received two purple hearts and one bronze star. Charles O. Green Jr., 67, spent his service in the U.S. Army in Vietnam 1968 and 1970. Hayward Garner, 68, who has two purple hearts, was apart of the U.S. Army in Vietnam 1968-69. James Nall, 71, spent two years in the U.S. Army and one year in Vietnam and received one purple heart and one bronze star. Commemorating the act of service can come on and off for servicemen. After completing his tour in Vietnam, Green flew into Washington to stay for some time and soon flew back to LAX to be home. While arriving to the airport, he was arrested while in his uniform and experienced forms of racism. "People don’t understand that we had to experience the terrors that come with serving the country and coming back to face the terrors of being Black in America,” said Green. During the time of the Vietnam War, the U.S. was experiencing its own war—the war of separation through racism. Many of the African American service members had to come back home to deal with the criticism they would face from anti-war enthusiasts and segregationists. “It was like a double whammy for Black vets. Some of us returned home with bad discharges and had no amnesty—due to racism. That’s when post traumatic stress started to kick in,” said Overby. One thing Veteran’s Day doesn’t seem to highlight is the crippling effect of Post-Traumatic Stress Disorder (PTSD) on the lives of veterans. Black veterans unfortunately have the added stress of racism to complicate their return to society. The veterans spoke about the various trials they faced coming back from the Vietnam War. “We were trained to fight, to shoot, hand-to-hand combat, all that good stuff but to kill somebody, kid, woman, another man—to kill someone, to stand there and shoot someone and see them fall, see that bullet hit them—that’s a whole different ball game,” said Green. “After I left the war, I didn’t want to put my hand on [a weapon] because I see so many things out in the world now—it can really anger you. I don’t know if I could trust myself with a weapon,” said Nall. The violent and traumatic realities of war altered their lives tremendously. Some of the vets spoke about how they experienced being ostracized or went into self-imposed alienation from friends and family. “When I got home, I’d get all these stupid people coming up to me insulting me,” said Roberts. “When I started getting jobs, I had a problem with authority,” said Garner. “I left several jobs. 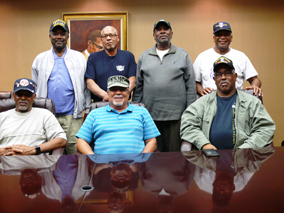 The veterans’ group meetings turned out to be heaven sent when it came to healing from their experiences. They were able to find comfort and understanding in each other’s struggles. “I started feeling good when I got to know all these guys [members of his veterans group] because we all suffered from the same and we could understand each other,” said Overby. “I’m with these guys every Wednesday and it just helps me to cope with what’s out there. It gives you a leg up on stuff that you’ve done,” said Jarrett. At the end of the day, their saving grace is each other—they have the same story. Veterans share the common threads of war with blood, tears, heartache but most of all hope. It was hope that was behind each of their stories as they spoke about their journeys back from war.